Billy, you come from a very small island Dominica with a population of just 72,000 people. Please tell us how you got into cricket? From early in my life, I’ve always been involved in sports. I loved football in particular. Football has always been my number one love; I even managed to referee a couple of FIFA world cup qualifiers. But being in the Caribbean I realized that probably I could go further in cricket umpiring. That is why I had to make a change from refereeing to cricket umpiring and I started off with cricket umpiring by chance. When I was 18 I went to watch a school level cricket match. One of the umpires didn’t show up and the other umpire asked me to hold on for a while. I thought that I had been holding on for about 10, 15 minutes, but I held on for the entire pre-lunch period. At lunch time, I told him, well, I have to leave because I didn’t come here to umpire. I just came here to watch. I left and he told me that he would bring a cricket law book for me at school on Monday morning. This he did and that was the very first time in my life I had seen a law book when he brought it for me on the Monday morning at school. I started reading it without any intention to become a cricket umpire because I still had aspirations in those days to be the next Garfield Sobers, since I used to play quite a bit of cricket. When I left school, the gentleman came to me. His name was Phillip Alleyne and he has been my mentor ever since. He encouraged me to join the Dominica Cricket Umpires Association when I left school. That was in 1975. Since then, I’ve been a member of the Dominica Cricket Umpires Association and the rest as they say is history. You mentioned Phillip Alleyne. How was he helpful in your development process? He was the main person. He was the President of the Dominica Cricket Umpires Association at the time. He is still alive. My parents were very instrumental in helping me. They encouraged me to join the Umpires Association upon his feedback to them. When I was a bit skeptical to join, Mr. Alleyne came to my home and spoke to my parents. He told them that he wanted me to join and he encouraged me. I have two older brothers who played cricket for Dominica. They also encouraged me to join the Umpires Association and also one or two of my very close friends. I feel like I had no intention to become an umpire. I wanted to continue playing, but they encouraged me to join and I was still playing, and umpiring in the lower leagues at the same time. A lot of people all through the population of Dominica, they really encouraged me, because that was the first time a Dominican was striving to reach that level. They always encouraged from very, very early. All of these persons made a significant contribution to me becoming an international umpire. How important do you think it is for an umpire to come from a playing background? Well, I played cricket not for Dominica. I played just club cricket. I was a decent batsman because I won the trophy for the most runs on three different occasions in our league. I was a decent cricketer. If you have played, it could help a lot to understand the emotions that the players go through, to understand what the player feels, the pressures they are under when they get a bad decision. You can relate to that because it’s never good. It’s never a pleasant feeling when you as a player get a bad decision or when you as an umpire give a bad decision. That’s part of the game. However, it wouldn’t make you an international umpire just being a player, but it can assist you. It doesn’t mean that if you?re not a player, you cannot become a very good umpire. It doesn’t mean that either. It can complement your ability as a cricket umpire, because you can understand the emotions and the intricacies of the game. You understand what players feel when they are going through the particular game. I think it can help. Your first Test match was a pretty exciting game. Please talk to us about that experience. My first Test match that I umpired was between West Indies and Pakistan in 2000 at Antigua. It was a very, very tough game. From very early, the Pakistanis made me know that it was my first game. They were passing around, throwing little comments. Just trying to put that psychological pressure on me. I always loved Wasim Akram and Waqar Younis. Those guys were my heroes and to do my first game with them playing and on the West Indies side, you had guys like Jimmy Adams, Courtney Walsh and Curtly Ambrose. There were a lot of my heroes in that game. I was a bit nervous in probably the first two hours. There were many Dominicans who traveled to Antigua to support me in that game. When I was walking out on the field that very first morning, a lot of the Dominicans, they were calling and chanting my name. It really let me feel good and I really felt comfortable. As the match progressed I made an error in the last session and so did my colleague. A lot of people would not remember the rest of the game since the match went down to the wire and these mistakes were made and when umpires make a mistake, people focus on that. I have to say I was satisfied with my performance in that game despite that mistake. . I got two good reports although I made that mistake. It was a really pressurized game, but I felt I did well. It was an eye-opener for me to understand the pressures that a Test match umpire goes through. I was very happy with my performance and the match referee himself gave me a very good report. He said in his report that I would become a very good international umpire. I would like to believe that I in some way fulfilled that wish for him. You talked about the mistakes that you made. That game was in 2000 and nowadays umpires are scrutinized even more with the extent of the technology. How would you advise somebody, who makes a mistake on the field? How did you improve yourself and how did you come out of that feeling after making a mistake? First of all, you have to realize that in umpiring, you will make mistakes. No matter how good you are as an umpire, you will make mistakes. You have to recognize that when you do, you have to tell yourself that it is not your first mistake; neither will it be your last. It’s a mental process. You have to prepare yourself for the next ball or for the next session or for the next day. It can be very mentally testing. If you’re not careful, you can carry that back to your hotel. You can sleep over it for the whole night. You have to try and tell yourself, Okay, I’ve made a mistake. Let me put it behind my back. Let me recognize that it’s gone. Let me prepare myself for the next ball or for the next session”. It’s something that all good umpires do. The quicker you can overcome that mistake, the quicker you can put it behind you, put it away from you and put it away at the back of your mind, then it’s better for you. If you keep on thinking about it, it might encourage you or help you to make another mistake. You need to just put those things behind you as quickly as possible. You talked about mental process, how difficult of a job is umpiring? The reason I ask is batsmen switch on and off between the overs, the bowlers get a break. Umpires don’t. How does one keep the focus? Umpiring is very, very difficult because I will tell you why. I was also an international football referee. At the end of a football game, you could find yourself tired, but if you’re in a good condition, then you can probably go out in the evening with some friends for a drink since it’s just an hour and half on the field. At the end of a day in cricket you are pretty much exhausted, you just want to have something to eat, have a shower and go to bed because it’s very, very tiring. It’s not only physically tiring, it’s mentally tiring and the concentration levels have to be upward. You as an umpire have to know when you can tone down and when you focus again because you’ll not be able to focus, keep 100% of focus for the entire day. You have to be able to know when you can down your focus and when you have to up your focus. When the bowler is running in to bowl, then you’re on high alert. After that, whatever happens after the ball, and then you can tone down a bit. It’s important that you know yourself; you know your concentration levels. You have to prepare yourself. You have to prepare yourself both physically and mentally because if you’re not physically fit, then you will get tired. When you get tired, the first thing that goes is the mental concentration. You have to know that you’re in good physical condition and also, you are in good mental concentration. Oh yeah, the relationship with the players is very important because they have to be able to have confidence in you and trust you. Even when you make a mistake, they recognize that that is a mistake. I was very happy with the relationships that I developed with the players. I cannot say that I had any major difficulty with any player or any team or any country. You had instances where guys were not happy with the decision that you made, which is understandable. When they are out, they are under the pressure. If you make an error and especially if the error has an effect on the results of the game, then they will be upset, and that’s normal. I think I was very happy with the relationship that I developed with the teams. I can say that there were some captains that were more difficult to deal with than others. Generally, I was very happy with my relationship over the years. I think that the players trusted and respected me. To give you an example, a guy like Shane Warne can be on your face and pressurize you and intimidate you, I think in one of my first few Tests as an elite umpire I had a very tough game with Australia vs South Africa where I stood with Steve Bucknor. I had an error-free game, But Shane Warne was constantly appealing and putting pressure on me, but I was confident about my calls. At the end of the game, he came to me and I can never forget when he congratulated me and said “Billy, You had an excellent game”. He really tried and put pressure on me and I know that I had earned my trust with the players then. What are your views on the DRS? I think most umpires will tell you that if they make a mistake, if it can be corrected immediately so that it cannot impact the results of the game it is a good thing. Unfortunately the DRS now is being used as a strategy by teams. 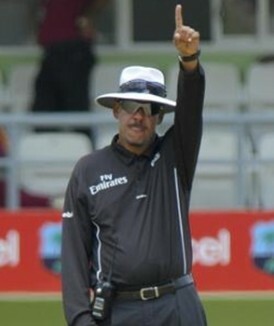 If they have it in hand, they will use it just to put a little pressure on the umpires. I think it minimizes the errors in the game, and that is the bottom line. In any case, when you look back at the history of the umpires, most of the umpires are recorded well into 90% of accuracy. I think that is very good. With the DRS, it is almost 100%. You’ll still find sometimes people who are unhappy with the third umpire’s decision because they will say that what they see is not what the umpire is deciding. Generally, most of the DRS decisions are correct. It’s just unfortunate that the ICC cannot reach a situation whereby that every team, all the teams use the same level of DRS. I think that it is so important that I think every country should have not minimum standards, it should be the same standard in every Test match all over the world. Unfortunately, because of many different reasons, which I cannot get into, it seems that some countries are not totally happy with DRS; some countries cannot afford the cost because they are a very expensive thing to have all the technology. Generally, I think that it is a good thing and, as I said, the intention of it at the end of the day is to minimize errors and to get most decisions correct. If there was one change ICC has to make from an umpiring perspective what would you recommend? One change that I would like to see in cricket, let’s suppose that there is a throw at the stumps and the ball hits any part of the batsman, especially his bat and it goes out in the open, I think it should immediately be deemed a dead ball. Sometimes you find players not running, which is a call that they have to do. Other times, they will run and I ask quite a few players that, let’s suppose there it’s the last ball in a World Cup final, if the ball hits the bat and it goes away, if they can get another single to win the World Cup, whether they will run? Every one of them told me that they would run. I would like to see it not be dependent on the will or the attitude of the batsman. I believe that as long as the ball hits that batsman and goes off to the open play, I think that ball should be considered dead, so nobody can really say if they are going to run or not. It should be a dead ball. I believe that based on the circumstances of the game, a player cannot decide whether they run or they are not going to run. I don’t think it’s good for the game. What’s the most memorable match that you umpired? The Twenty20- World Cup in the West Indies is close to my heart. It was an honor for me to have been chosen to do the World Cup final. In that tournament, I had an error-free tournament up to the final game. I made an error with a caught behind in that game. I had an excellent tournament up till that game. I was very pleased when I was appointed to do the final in front of the Caribbean crowd. That will always stand out in my mind. My first test match at Lord’s will always stand out. I loved doing cricket at Lord’s. I loved doing matches at Melbourne. It was of my favorite grounds in world cricket. Also, Kolkata in India because of the crowd. One time, I did a test match there, India vs Pakistan. You know when India plays Pakistan in any sport, you know the rivalry. There were about 90,000 people there. There were more people in the stadium than in my entire country. When I told this to the people they could not believe that. A lot of the grounds in the world meant a lot. All of them have a history and I really enjoyed umpiring in all those grounds. When I look back at my career, I have really, really been pleased with the places that I’ve gone to. You mentioned that umpiring is a physically and mentally challenging job. If you look at MLB, they’ve got crews. The umpires are not the focus there. Do you think ICC should invest more into getting more people to come into umpiring? There are only a handful of umpires who are doing pretty much all the games around the world and that gets to them. Does it not? Definitely. When I was on the panel, I recommended to the authorities that they try to increase the numbers on the panel because what happens is that when umpires continuously do games, it can get to you. Just the traveling alone can get to you. The traveling and the consistent pressure, it can get to umpires. I have seen very good umpires, if you look at their performance, very, very good umpires based on their level of games that they do and the frequency of games, then you start seeing a few little errors. I put it down to these guys are just physically and mentally drained and tired. I personally would have liked that they increase the members so the workload on the umpires would be less and the umpires would spend a little more time with their family. When you’re aging and the umpire only has one month in a year when the ICC will not appoint you. They give you a one month block free. Any other time of the year, they can appoint you at any time. You only have basically one month off. Sometimes, I have gone home for just 5 days, Sometimes 2 weeks, sometimes a week. That puts a lot of pressure on you when you have your family and so on. I would really like to see an increased number of Elite Panel umpires to decrease the workload on the umpires. I suppose the reason that the ICC decided that they’re not going to be increasing that is they want the cream of the crop, the very best. They don’t want to open it out too much, which I can understand. If they see that the workload is a bit heavy, then sometimes they use members of the international panel. But we need more people so that the workload is balanced and the umpires can give their best on a more regular basis. No interview of you is complete without talking about the 2006 Oval Test. If you don’t have a problem, Please tell us what happened? I don?t have a problem. I wouldn’t be able to go into any detail. All I can say is that both my colleague and myself, and even now when I look back, were convinced that the Pakistan team was interfering with the ball. I have no doubt about that in my mind. When we saw the way that the ball had deteriorated in quick time, we recognized that somebody was interfering with the ball. Where my colleague and I differed was, let’s hold on. Let’s observe a bit more so that we could try and identify who was responsible, but he was adamant that we should take a decision right away and penalize the Pakistan team. He was a much more experienced umpire than me at that time. That was only my second test match on the Elite Panel. Although every umpire is equal, but sometimes, you have to understand that because of the circumstances, you will find an umpire having more authority or more influence on the other umpire. So I went along with him. There are no doubts in my mind, without going into detail, no doubts in my mind that that ball was interfered with. One of the ICC officials, when he looked at the ball for the very first time, all he said was, “Wow.” I don’t want to call his name, but when he looked the ball, all he said was, “Wow”, and he looked at the way that the ball was interfered only on one side. There was no doubt in my mind. That whole incident taught me a lot. Not only about my umpiring, but about me as a person. It was the most difficult time, I would say, of my entire life because right after that thing happened, my colleague, he got support from Cricket Australia in terms of offering him legal assistance, offering him emotional help , offering a lot of advice. I had to be on my own. I had to be on my own there in a hotel. Fortunately, I have a brother in England who assisted me to recover. He came to collect me at the hotel a few days after and then he brought me to his home. It helped me to recover. It taught me a lot about myself, how to handle adversity, how to react facing adverse conditions. It made me a much stronger person, much stronger individual. Whilst it was a negative in terms of my umpiring career, it taught me a lot and I transformed it into a positive because it taught me a lot and I learned a lot from that experience. You are CWs superstar scribe, Venkat Keep rolling them out! Hail the Man! Now a tough question, do you think calling Sunil Narine was fair? Billy, great career! You have made Dominica proud! Billy was one of the most underrated umpires on the Elite Panel. Yes He made mistakes, but he hardly made Howlers like some of his more illustrious colleagues. I still would have liked to meet him to offer my congratulations on a wonderful career.